London Bound, the third and final book in C.J. Duggan's Heart of the City series was published last week. I've enjoyed each book in this series and I'm sad to see it end, but I'm looking forward to what she will deliver next! 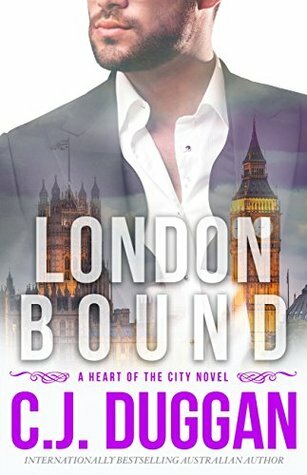 Oh, how I've enjoyed the Heart of the City series! Each book has been unique, set in different cities around the world. And each character has a different feel too, even if the girls are all Aussies! I've been swept away with each storyline and the fantastic writing style of the author. If you haven't tried C.J. Duggan's work, you should do so now! Poor Kate, I really sympathised with her, travelling so far away and basically being held as a prisoner due to an overprotective Nana! I could see she just wanted to spread her wings, and she grabbed onto anything that she could that interested her. I liked that she ran her own blog and was passionate about fashion. But the most amusing part of the book was watching her with Jack Baker... the guy that almost run her over. It was good to see Jack and Kate together, despite him being a little closed off about who he was. He seemed relaxed around Kate and enjoyed her company, where as Kate found him to be annoying to begin with. Each time they were together, I could see the attraction building and that Jack seemed to be trying to get Kate to like him. I especially loved the way that Jack was able to transform Kate's Nana Joy into a swooning girl! She had not one bad thing to say when he was around! When they realised they had more in common than they thought, their relationship became a lot easier and it was sweet to see them let down walls and give in to that attraction. I find C.J. Duggan to have a light and intriguing writing style. The characters are easy to relate to and I feel like I'm right there experiencing everything they see and do. Kate and Jack were an interesting couple and were vulnerable in their own ways. They were afraid to let anyone too close but had determination to succeed at anything they put their minds too. Now that this series is finished, I'm eager to see what C.J. Duggan will publish next! I have two snippets today, I thought the first was cute, and the second one was what I was waiting for! So agonisingly slow was his approach I almost expected him to pull away, but he didn’t, though it gave me just enough time for the rational part of me to object. Jack kissed me. Cutting off my words, pulling me against him, he kissed me so passionately that I found myself gripping the edge of his jacket with a white knuckled intensity, anchoring myself in case my legs went from underneath me.